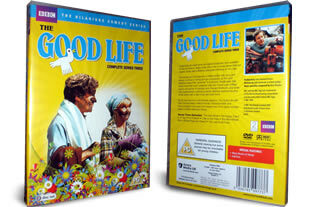 The Good Life Series 3 DVD set. The complete third series on 2 dvd's. DELIVERED FREE IN THE UK WHEN SPEND OVER £15. The Good Life was a classic 1970's sitcom about an eccentric middle class couple who decide to leave behind the rat race and live off their land, still staying in the same house. They turn their front and back gardens into allotments also have chickens, pigs and a goat. 2 DVD Set delivered to your door.